Great listening and great questions go hand in hand, and both are necessary in uncovering the client's real needs. Why is this important? Because the value of your solutions is enhanced when you better understand the problems. What technical professionals often miss is that the client's problems are typically defined in large part by nontechnical, even subjective, factors. Asking the right questions involves exploring areas outside the limits of your expertise. In my previous post (Part 1), I outlined a basic strategy for planning and asking good questions. In this space, I want to talk about question types and sequencing. Sound a bit too esoteric? There is actually quite a body of evidence regarding the power of questioning strategy. When was the existing facility constructed? How much do you have funded for capital improvements? What steps has your agency taken in response to declining revenues? Is the current system meeting your needs? How often has the plant exceeded permit limits? Why do you think flows have increased so dramatically? Consequence Questions. 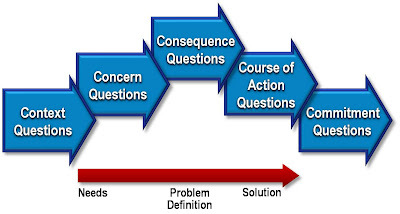 While each step of the Question Progression is important, Consequence Questions represent the apex of the process. And, unfortunately, this type of question is often overlooked in discussions with clients. Consequence Questions seek to uncover the implications and magnitude of the concerns identified earlier. These consequences are often expressed in terms of impact on the client's business or mission and on the people involved. Here's why Consequence Questions are particularly important: Handled properly, these questions not only uncover the impacts of the problem for your understanding, they help clarify them for the client (combined with your shared insights). This has the effect of magnifying the perceived problem, which makes your solution all the more valuable (and less price sensitive). I don't mean to suggest that you are "playing up" the implications of the client's issues. Rather you are helping the client better understand their real need. How does this problem impact your operational goals? Is this a significant concern to the community? How do you feel about the council's response to this issue? What if you simply added a second chamber? Would that work for you? So are you thinking that reinforced concrete is the better option? So how soon do you need that to be completed? Could we set up a meeting with the City Manager? Are you willing to recommend this option to the committee? Would you be interested in visiting that facility with me? The Question Progression moves the dialogue with the client from an initial needs assessment, to problem definition, to development of potential solutions and selection of the best option. Pretty basic, isn't it? But not as commonly done as one might imagine. That's why using the Question Progression effectively can give you a competitive edge. Next week, the final installment in this series of posts on uncovering the client's needs. Stay tuned.